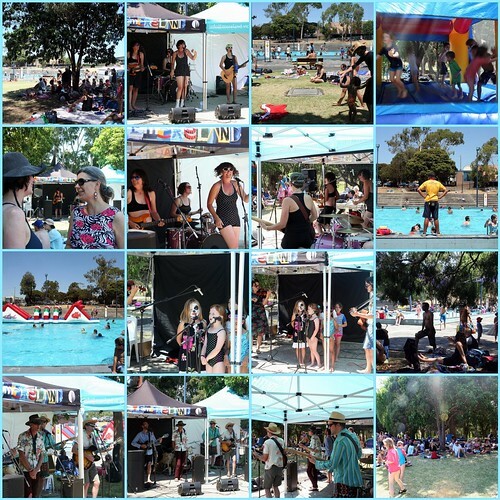 Congratulations and thank you to all involved in the fantastic 5th Coburg Olympic Ride to Pool Day! Thank you Naz, Brad and staff for organising and running such a brilliant day so smoothly. The day was greatly enjoyed by all and the atmosphere was wonderful. It was very hot and the big pool was jam packed with children. Thanks to all Active Moreland staff for exemplary managing and life guarding all day. The Pool Inflatable was a great hit as was the face painting and jumping castle. There was also the much loved sausage sizzle and a great new addition, the coffee cart. FCOP's "I love Coburg Olympic Pool T-Shirts" were a hit. As was the clock history display - great idea. The live music was perfect! Thank you to all involved in securing grants and fundraising so that we could continue the fine tradition of live music by the pool. The Shambelles were a high energy girl band donned in swim suits and white sunnies. The Short Order Schefs were cruisy, perfectly blending pool and lounge music. The Newlands Children's Choir were gorgeous and led by music teacher Jane and her guest violinist. Moreland FREEZER - thankyou Sal and all for the DJ, great sound and stage management! Bike parking was also very well utilised and it was great to be a Bike Satellite Event and having our event as part of the Bike festival has alerted lots of post code 3000s to the pool. The newly fixed and re-installed Lions Clock was working a treat too! Thanks to Active Moreland who helped facilitate that. What a great day at the pool!